If there was one thing that was in plentiful supply in the '80s, it was movie soundtrack hits. By my calculations, there were 19 chart-topping singles associated with films during the decade (not including songs like "I'm Gonna Be (500 Miles)" that would go on to be used in movies down the track). Even a New Zealand movie based on a comic strip spawned a number 1 hit in Australia. Although chances are, like many of the chart-toppers, the song would've been massive without the film tie-in. A song that reached number 1 without a movie association - or radio play or a music video - was still on top this week in 1987. "Boom Boom (Let's Go Back To My Room)" by Paul Lekakis was the most popular song in Australia for a second week. Not even the Stock Aitken Waterman Midas touch could turn this debut single by the then-16-year-old future Mrs Bill Wyman into a hit - either in Australia or the UK, where it peaked at exactly the same position. Speaking of SAW, they had a hand in this debut single by former Wham! backing singers Pepsi DeMacque and Shirley Holliman - although exactly what part the Hit Factory played in the record has long been debated. Regardless of who produced, mixed or was otherwise responsible for it, "Heartache" was a brilliant pop song from a pair of singers who'd contributed to their fair share of classics over the previous few years. In the UK, the song was denied the number 1 spot for two weeks by none other than their old boss, George Michael (together with Aretha Franklin), while in Australia, "Heartache" criminally progressed no further than the exact opposite end of the top 50. Their next two singles, "Goodbye Stranger" and "Can't Give Me Love" missed the top 100 completely, and we'd next see the duo just outside the top 50 with their cover of "All Right Now". It'd been almost five years since the world had heard any new music from Fleetwood Mac, but in 1987, the best known lineup of the band returned following various solo endeavours with what would end up being the second biggest album of their career, Tango In The Night. "Big Love" had started out intended for Lindsey Buckingham's next solo record, but ended up on Tango... instead - and became its lead single and the band's 10th top 20 hit in Australia. Contrary to popular belief, all the vocals heard on the song are provided by Lindsey, with the female-sounding gasping noise achieved by altering his voice via some studio trickery. Given the romantic history between the various band members, the recording of Tango... was as fraught as you'd expect, resulting in Lindsey quitting Fleetwood Mac shortly after the album's release and ahead of the world tour to support it. "Big Love" wasn't performed live by the band until he came back into the fold a decade later. Movie hits were one thing, but successful songs from TV shows weren't quite as common in the '80s. 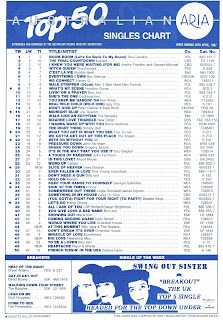 This 1981 single had Family Ties to thank for its belated chart action. Originally released on Billy Vera & The Beaters' self-titled live album, the song was only a minor success in the US, but once it started being played as the theme song for Alex Keaton (Michael J Fox) and Ellen Reed (Tracy Pollan, aka the future Mrs Fox) in the hit sitcom, interest in the track prompted a reissue and an appearance at the top of the Billboard Hot 100 in January 1987. A few months later, Australia sent the soulful ballad to just outside the top 10. Billy continued his association with TV series, performing the theme songs to Golden Girls spin-off Empty Nest and The King Of Queens. Here's another one of those film hits now. 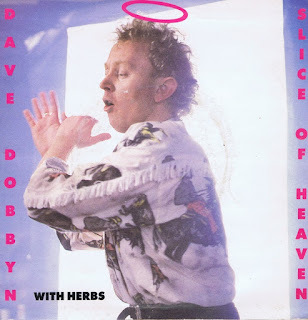 Taken from the animated family film Footrot Flats: The Dog's Tale (which I saw at the movies when it was released in 1987), "Slice Of Heaven" was the Australian breakthrough for New Zealand singer Dave Dobbyn, who'd previously been a member of Th' Dudes and DD Smash. And what a breakthrough it was - a four-week number 1 hit that ended the year as 1987's fourth biggest single. A huge part of the appeal of "Slice Of Heaven" came from its incorporation of two elements: 1) the Japanese flute that opens the track and 2) the backing vocals of Pacific Islands vocal group Herbs - both of which gave the cute pop song that extra bit of oomph. Although Dave never returned to the ARIA top 50 - coming closest with the follow-up single - "Slice Of Heaven" has lived on thanks to its use in New Zealand tourism ads and being a regular inclusion on retro playlists on music TV. Next week: the best version of one of the most-covered songs of all time and a remake of a song that wasn't even a year old. Plus, the Queen Of Pop goes Latin. The Mandy song always sounded to me like it could have been Bananarama. She looks like the poster girl for anorexia in the video, and not even those shoulder pads or dragged-backwards-through-a-bush big hair can hide it. I thought I read on a forum (so it must be true) that the SAW credit on 'Heartache' was just used as a marketing technique, and they didn't actually have anything to do with the record. My favourite bit of 'Big Love' was the female-sounding gasps. Somehow, 'Slice of Heaven' sounds distinctively Kiwi; I guess due to the Maori backing vocalists. I assumed that was a singer rather than a Japanese flute! Just asking Gav are you gonna be posting the charts to pre-July 1983? 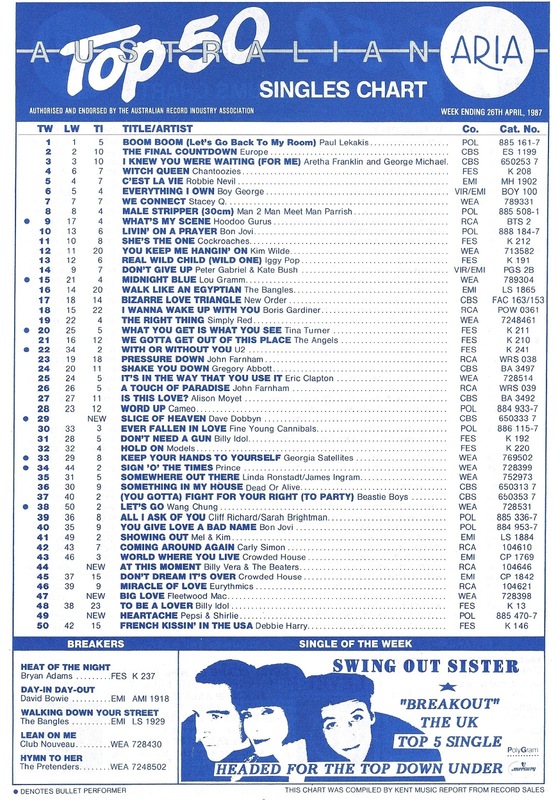 There weren't any printed ARIA charts before that date unfortunately.